A healthy, nutritious breakfast you can put together the night before. Place the oats in a large bowl. Add yogurt and apple juice, and stir to combine. Cover the bowl with plastic wrap, and place it into the refrigerator overnight. In the morning, remove the plastic wrap and stir oat mixture. The mixture should be thick and creamy. Divide oats between two serving bowls, and top with seeds and fruit. Serve cold. Rolled oats are rich in fibre, protein and provide a low GI source of carbohydrates. Oats will help keep you fuller for longer. 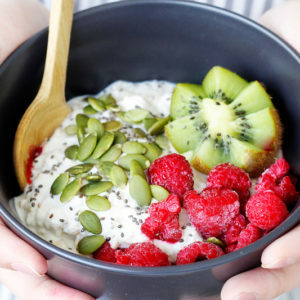 The Greek yoghurt in this recipe provides a great source of protein and calcium, and the seeds are an excellent source of fibre, protein and healthy unsaturated fats. Vanilla flavoured yoghurt Greek yoghurt instead of plain. Any variety of nuts and seeds can be used when serving. Serve with a variety of fruits such as fresh or frozen berries, passionfruit, sliced banana, grated apple or stone fruits.